Are you on a vegan diet? Are you tired after work? There were big problems with driving on the road? Do you want to eat a hot dinner at home immediately after work? Then this book is for you. So, move over classic cooking…. Slow cooker cooking is back! Most of the recipes in this book call for 6 to 8 hours of cooking time. This is very useful for those of us who are out of the house from early morning until dinner time. However, many of the recipes will be fully cooked in approximately 2 to 3 hours, and some may be ready even sooner than that. Nevertheless, leaving food in the slow cooker for the day will not diminish its flavor or texture. The beauty of a slow cooker is that it not only cooks your food without tending, it also keeps it piping hot until you are ready to serve it. 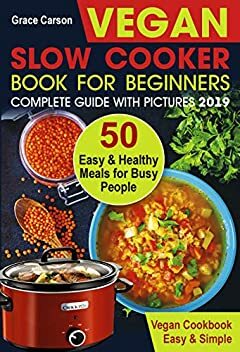 Veganism and slow cooker do not go hand-in-hand, as Vegans tend to eat quite fresh produce and food that requires no slow cooking through longer periods. Still, some Vegan meals can be made in the slow cookers, like certain stews and chilies. But the point of the slow cooker is not always about the slow cooking, but the freedom you have with the slow cooker. A slow cooker is an appliance that saves you time. We know it sounds weird as slow cooker cook food for a longer period, but it does without your full attention. Unlike classic cooking techniques, you can dump ingredients in a slow cooker and cook without stirring or moving the food around, and you will always get perfect results. Vegan diet tends to eat a lot of nutritious meals, but who has time to make them all? Especially with all daily chores ahead of us. Would it not be great you step into your home and have a ready and cooked meal? Although it sounds like a dream, it is possible with the slow cooker appliance. gourmet main courses, inspiring bean, grain, and vegetable dish and delicious desserts to satisfy your craving for sweets. • Helps ward of diseases, such as cancer and coronary artery disease. • Helps maintain a lower weight. • Ease symptoms of menopause. Slow cooker meals have become a staple in many homes because they are easy and convenient. Learning to cook in a slow cooker allows you to simply throw various ingredients inside and return to a fully cooked meal hours later. If you thought that finding meatless slow cooker recipes was challenging, these delicious recipes would change your mind. Everyone is looking for ways to stay healthy and live longer; by eating Vegan, whether you do it every day or part of the time is a smart choice for your overall health. All that’s left to figure out is what you’ll do with the extra time you’ll save in the kitchen! If you click now and buy this book slow down and relax with the tasty meals!